Squad's longtime host, the King Conservation District, hosted us at their unique wetland plant nursery in Renton. To top off an already fun day, Squad got to engage in a brand new activity—a sudsy multi-step glove washing station. It perfectly combined useful work to be proud-of with total soapy chaos. (Biodegradable soap naturally.) It was loved by many-a-youngster and everyone else witnessing their joy. In order to get our gloves dirty we potted over one hundred bare root Indian plum / osoberry / Oemleria cerasiformis shrubs. Interestingly, this is the only species in the genus Oemleria. It is sometimes grown for ornamental purposes in other countries because of its very early flowers on nearly bare stems. In addition we mixed-up potting soil to KCD's specs by combining 50% GroCo with 50% mineral-based soil. GroCo is a compost that includes Loop biosolids which is comprised of the organic matter left over from our wast water treatment processes. These screened, cleaned and tested solids are a valuable material as they help to conditions soil, are a never-ending resource and are best recycled. Tall Cottonwood / Populus trichocarpa trees prematurely dropped fruiting-clusters on the nursery, perhaps during high winds, they will split open to release the fluffy 'cotton' tufted seeds inside, soon to rain down like snow in summer. King Conservation District's Wetland Plant Nursery itself received some weeding this time around. The landscape fabric accumulates debris in the overlapping areas and weed seeds need only the slightest soil environment to germinate in. Unfortunately the soggy long spring didn't help us view tadpoles in the flooded beds, the steady raindrops and cool weather didn't facilitate good viewing this time around. Before we know it it will be summertime and we can enjoy Squad events with swim spots afterwards! Sunny Potting at the Wetland Plant Nursery. Squad always enjoys working with AmeriCorps crews, on this occasion we worked alongside the Washington Conservation Corps potting bare root native snowberry, salmonberries and red alder- six hundred and fifty in all! King Conservation District’s Wetland Plant Nursery was bustling with many kids mixing-up potting soil, hauling it to potting locations, pruning roots, loading and driving carts, watering and potting. The weather cooperated beautifully, we look forward to returning in the spring when the flooded wet beds will be full of tadpoles or baby frogs. KCD hosts a bare root native plant sale every March, though pre-orders are closed you can still purchase plants on site Sat March 11th. Filling Wildflower Packets to Help Pollinators with the King Conservation District. I'm always excited when Squad has the opportunity to execute a new stewardship task. In our five-year history, this was the first time we filled seed packets! The King Conservation District worked with the Xerces Society for Invertebrate Conservation to gather and compose a seed mix that encourages pollinators in King Country. The mix is primarily native species, with a large number of perennials, but also annuals and biennials. The seeds will be given to the public and every participant was able to take one home. KCD is also offering workshops on native beneficial insects and pollinators. Additionally we weeded seedlings from the pots of natives- mostly cottonwood from the large trees near the nursery. Many of us drove home with cars full of native plants. The cooperative nursery calculates around 4 plants/volunteer hour which really adds up when volunteering as a family! And of course the tadpoles were out in abundance, to everyone's delight. Pots Pots & Pots in the Wetland Plant Cooperative Nursery with KDC. Yet another new task after four years of Squad- sorting pots, pots & more pots! The kids developed a good eye for determining minute differences between the pot styles- organizing them helps keep the nursery running smoothly. King Conversation District's unique wetland plant cooperative nursery is always a fun place to work. In addition, you earn $10/hr credit that you can use to take home native plants, even harder to find ones like delicate red huckleberry, native honeysuckle vine & our state's only native oak. If you are eager to get your hands on very affordable native plants be sure to put in an order (or shop extras day-of) for their bare root native sale. Orders must be in by 2/15 and pick-up day is 3/5. They have good cultural information as well to guide you on how and where to plant them. Spring Critters at the Wetland Plant Nursery. From damselflies & tadpoles to ladybug larvae & unidentified water insects, the flooded wetland plant beds are always a treat for the kids to explore at the King Conservation District's nursery. There were no adult frogs yet, but the fat tadpoles were fun. We potted-up alders and cascara / Rhamnus purshiana from 1 gallon pots to 2 gallons. Additionally, the kids had the chance to help load up a truck with native wetland and woodland species bound for Shadow Lake Bog which is a terrific-sounding nature preserve and education center in Renton. We look forward to possible working with them in the future to see our plants in action and tour the bog! Cascara / Rhamnus purshiana A charming small native tree. Alnus rubra / red alder roots showing Frankia bacteria- which are filamentous and convert atmospheric nitrogen into ammonia via the enzyme nitrogenase, a process known as nitrogen fixation. This enables alders to be incredibly fast-growing pioneer species on disturbed soils. Potting-up 400! native plants at KCD's wetland plant nursery. Wow, four-hundred might be a new Stewardship Squad record for the number of bare root plants potted up. We enjoyed very warm sun and a nice crowd at the King Conservation District's wetland plant nursery for planting red osier dogwood and salmonberry into pots for future-use in restoration projects. The kids checked the flooded beds for signs of their beloved tadpoles, but will have to come back in the spring for much activity. They worked so swiftly that they also had plenty of time for the usual tag, hide & seek and epic snacking- essential components of most activities. We look forward to using these plants out in the field at future work parties. More Wetland Planting on Longfellow Creek with KCD. This time along the Longfellow Creek Trail (Brandon Street Natural Area), we planted wetland grasses in a low, soggy area- Carex obnupta / slough sedge. A common task at King Conservation Disctrict's wetland plant nursery is to divide such fast-growing species as these, indeed some were so root-bound that stomping, punching and pulling failed to dislodge them from their pots and Adam had to slice the pot (and plant) through with his shovel. Upon finally freeing them, it was a significant task to loosen up the vigorous root system before planting. Other species planted under the frosty, sunny alder forest were Symphoricarpos albus / snowberry & Thuja plicata / western red cedar. Frogs, tadpoles and many tasks in KCD's wetland plant nursery. The frogs and tadpoles didn't disappoint at King Conservation District's wetland plant nursery. The flooded beds holding potted wetland species were teeming with delightful creatures. These are encouraged with plant-flats left in the pools to create habitat. We had to be careful not to over-flow the beds when adding water, lest the tadpoles go overboard. My notes on exactly which species of rush, bulrush, sedge, etc. that we worked with didn't survive the trip home. However I did find this list of plants grown at the nursery. Giant bur-reed / Sparganium eurycarpum was the most showy plant we deadheaded (see photo below) as it has fetching spiky orbs and globular white flowers with leaves over head-height. I am excited to spot this plant out in nature! Hard to believe, but in 2.5ys of Squad, this is the first time we watered as a work activity. Other tasks included cutting-off seed heads to prevent species from seeding into other pots- because some wetland species are hard for even horticulturists to identify without the flowers, we left a few on for ID purposes. Fast-growing alders and cottonwoods had to be potted up as well. We look forward to using the plants we've tended out on a wetland restoration site in the future. The roof kept the rain off but the kids loved finding other ways to get filthy. We potted up red osier dogwood / Cornus sericea for use in restoration and habitat-enhancement projects. New potting soil was also mixed-up with a blend suitable for plants that like soggy feet and includes biosolids from the nearby water treatment plant. As usual, there was hot competition for who got to push the full cart. King Conservation District offers native plants in exchange for volunteering in their nursery. Come back in the spring and summer to see the tadpoles and frogs that love the flooded beds. King Conservation District's wetland plant nursery was a joy for the children to discover. The flooded beds of native species were as fascinating as the potting was fun. And a beautiful day to boot! 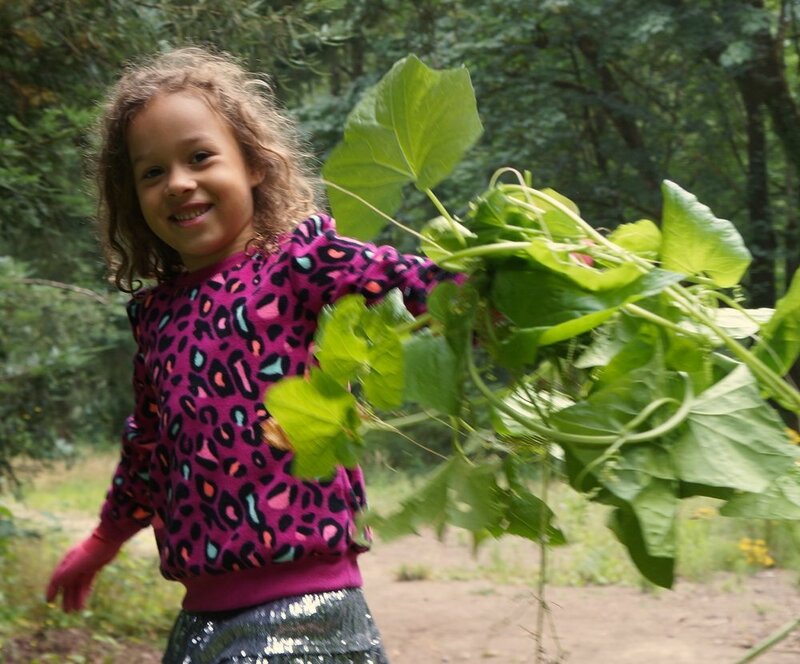 Since 2011, Seattle-area families have worked twice-monthly stewardship events in partnership with local organizations. Kids and their elders of all ages learn & play at friendly work parties in great locations year-round. Props to our terrific participating families- you make Squad great!